Bubbles are an essential element of the beer experience. The journey from bottling plant to your lips is a fascinating trek, one in which rough surfaces act like crags on a mountainside, bubbles congregate and grow like an advancing mob, and a foamy head makes its momentary appearance, only to disappear forever. Bubbles alter taste perceptions and add tactile pleasure on the palate, beginning with that lovely kssssh noise that signals a bottle cap twisted off and, praise be, a cold beer looming. And as with most things, your enjoyment of that beer—and those bubbles—can only be improved by a quick science lesson. Even though carbon dioxide is produced when you ferment grain to make beer, that gas is long gone before it makes it to the bottle. Instead, most beer has fresh CO2 pumped in at high pressure just before packaging. Once sealed, the gas goes into hiding, dissolving homogeneously though the liquid. So long as the bottle stays capped, these molecules are content to mix freely with the beer. However, once you pop the top, that equilibrium is destroyed and the pressure difference between the room air and the gas in the bottle makes that carbon dioxide want to escape. That’s where bubbles come in. If you look closely, you’ll notice that these bubbles don’t appear randomly. Instead, they always start life in specific spots—usually on the bottom or sides of your drinking vessel, be it bottle, can, or pint glass. These “nucleation sites” are patches that are rougher than the rest of the surface, causing the gas molecules that glide by to become stuck—like mountain climbers catching their fingers in a crag on the slope. Once a molecule is trapped, it serves as an attractor for other molecules until enough gas has glommed together that a bubble forms. It breaks its bond with the surface, and the bubble floats free. A perfectly smooth glass (or one still slick from the dishwasher) won’t provide many nucleation sites—and therefore, not many bubbles. Pint-makers often go so far as to etch glass bottoms for maximum bubble birth. When the bubbles form, they are small and rise slowly. But watch a newly formed sphere on its journey and you’ll notice that it both grows and accelerates. First, bubbles get bigger because they themselves are nucleation sites; dissolved CO2 in the liquid passing by the bubble gets absorbed and joins in the party. Second, bubbles speed up as they rise because the buoyant force propelling the bubble upward (which is proportional to bubble volume) increases faster than the drag force pointing downward (which is proportional to bubble velocity). With these forces out of balance, there are never any lazy, slow bubbles. Each bursts with a mighty pop. Guinness and some other stouts don’t use carbon dioxide, but are instead pressurized with nitrogen gas. The bubbles formed in these beers are smaller than CO2 bubbles, meaning they are sensitive to subtle currents that develop within the glass. In a tapered pint, more bubbles rise through the center column, carrying the liquid up with it. When that liquid reaches the top, it flows back down the sides of the pint (where the bubble density is lower), giving the illusion that these bubbles are actually sinking. In most non-Guinness beers, where the bubbles are fat with CO2, these currents are too weak; buoyancy always wins and bubbles always rise. Finally, we come to beer’s most distinctive feature: the foamy head that appears after a hearty pour. Why don’t other bubbly drinks like sparkling water or champagne get all foamy like a beer does? Beer head forms because the rising bubbles attract proteins and carbohydrates—long, spindly molecules left by the barley, wheat grain, and hops that are unique to beer—and pull them up to the surface. As these spaghetti-like molecules emerge, they form a net that holds the bubbles in place, making that pretty, lacy crown. Extra malty beers—such as stouts and porters—give up a lot of these proteins and yield some of the thickest foams. Couple this with finer bubbles from nitrogen, and you can see why Guinness’ silky head reigns supreme. Those nitrogen bubbles create a desirable creaminess, similar to the one craved within our current craze for nitro coffee (another liquid full of funky head-forming compounds). Though some view it as a nuisance, beer head is an important part of beer enjoyment. 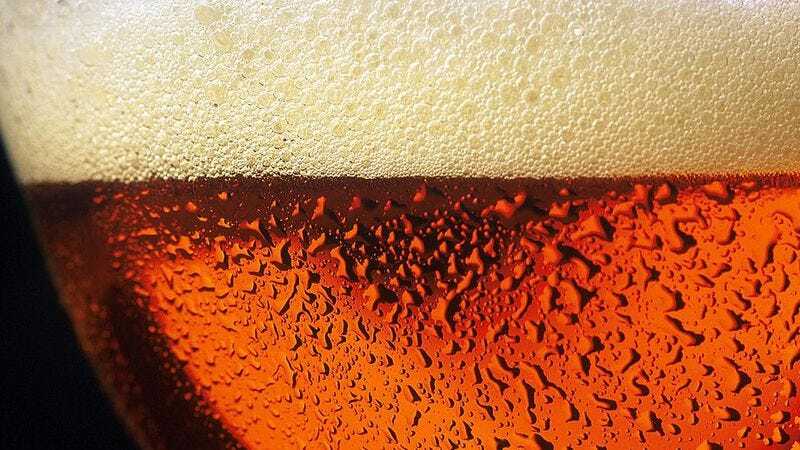 The smell of your beer—and therefore a lot of the flavor you can sense—is carried up and out of the liquid by the bubbles and into your nose every time you come in close for a drink. The creamy texture of a good beer head also affects your sense of taste more directly. Tiny dancing bubbles on your tongue soften the overall mouthfeel, and can even affect the balance between the bitter, sweet, or acidic flavors that you pick up. Ultimately, though, the head is unstable. The proteins are propped up by the bubbles, but as soon as their numbers dwindle, the foam collapses. This happens naturally when the initial surge of bubbles from a vigorous pour dies down, but there’s another common bar trick head-killer: Run your finger along your nose and dip it into the foam. The grease from your pores quickly reduces the surface tension of the bubbles, slaughtering them by the thousands. It’s brutal, but still: What an important—albeit short—life they lived, making your beer taste like beer.